Ajax, 25 km east of Toronto and on the shores of Lake Ontario, is part of the Regional Municipality of Durham. The Regional Municipality of Durham, (population 525 000), is a regional municipality with an area of approximately 2,500 square kilometers. Durham Region is considered part of the Greater Toronto Area and consists of the following local municipalities: Pickering, Ajax, Whitby, Oshawa, Clarington, Uxbridge, Scugog and Brock. With a current population close to 90 000, the Town of Ajax has been experiencing significant growth over the years. Along with a rapidly growing population, Ajax has a vibrant business community with over 1500 businesses and a labour force of more than 41 000. Residents of Ajax enjoy a high quality of life that sets them apart from other municipalities. With an average household income of $74 112, they exceed the provincial average by 38% and the Durham average by 11%. With a close proximity to the City of Toronto, an educated and skilled labour force and an excellent quality of life, Ajax has quickly become a key destination for businesses, residents and tourists. Ajax is governed by an elected town Council consisting of a Mayor, and local Councillors representing each of the town's four wards. In addition, two Regional Councillors each represent a pair of wards. The Mayor and the Regional councillors sit on both Ajax Town Council and Durham Region Council. 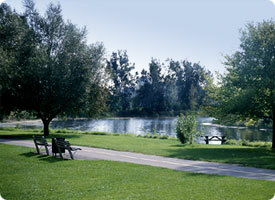 Ajax has over 465 acres of parkland and natural areas throughout the town. Ajax takes great pride in its Lake Ontario waterfront, which is the longest undeveloped waterfront in the Toronto area. The beauty of the Lake Ontario Waterfront is showcased by an unspoiled waterfront trail that crosses the Town. Rotary Park is located at the west end of the waterfront trail offering a unique setting at the foot of Carruthers Creek. The Harwood Point Gardens is located at approximately the centre of the waterfront, it is a focal point that creates an impressive memorial for the HMS Ajax. There are numerous walking trails in Ajax, totalling close to 38 kms! Eventually, there will be a comprehensive system of linked trails throughout the Town. Duffins Creek in the west and Carruthers Creek in the east form the major north-south greenway spines, linked by the 6-km. Ajax Waterfront Trail. A section of the Lower Duffins Trail is in place with the trail planned to continue north to connect with Greenwood Conservation Area.